Attach 1st file for front. 1 MB max upload. (Larger files please email to service@baileyandbailey.com include order number). 600-1200 dpi JPG format recommended. Attach 2nd file for front. 1 MB max upload. (Larger files please email to service@newmemorialsdirect.com include order number). Attach file for back option. 1 MB max upload. (Larger files please email to service@baileyandbailey.com include order number). 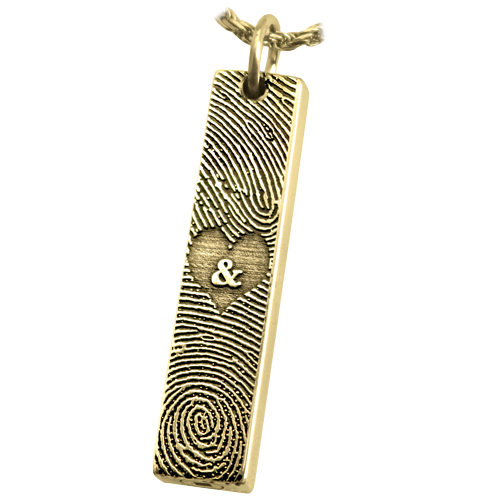 Adorn the face of this classic style bar pendant with two finger prints combined to create a special personalized memento symbolizing a perfect union. Metal Choice: 925 Sterling Silver, (14K Solid Yellow Gold, 14K Solid White Gold or Platinum). Pendant Style: Choose from chamber or non-chamber style. Chamber pendants have a discreet inner compartment that is air and water tight when sealed with rubber gasket threaded-screw closure. No chamber pendants are generally thinner without hollow inside. Back Options: You may personalize the back with another print (finger, hand or foot), handwriting, or text for additional cost. Side Options: Only the chamber style may be engraved on the sides when the text engraving option is chosen. Fee applies. Lifetime promise! The print quality is promised for life. If the print quality ever degrades, we will replace the piece free of charge. 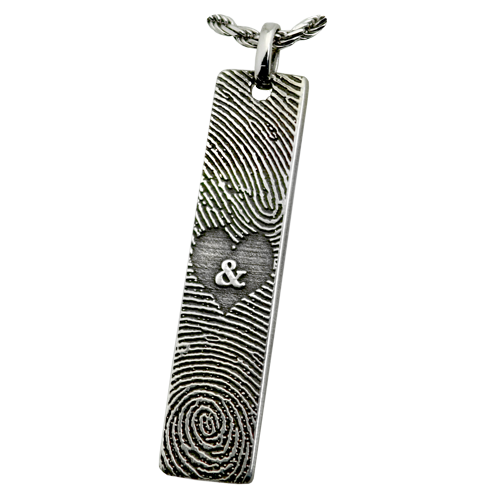 Standard fingerprint: 1 business day until pendant ships from the date we receive your fingerprint or other print file. 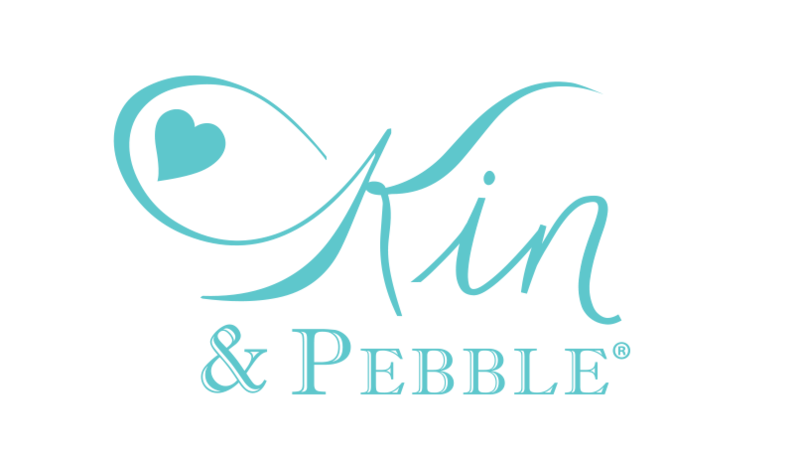 Solid gold or platinum: additional 4-5 weeks for 14K Solid Gold or Platinum orders. 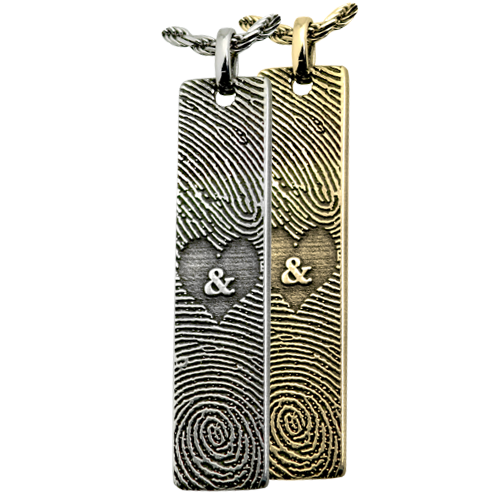 How do I Collect Fingerprints? You may use a digital fingerprint scanner. Or you may simply use any ink pad and plain white paper. Black ink works best. Begin by studying the thumb of the person whose print is being taken. Select the area of the finger (any print will work, it doesn't have to be only a thumbprint) that is the most interesting. It is generally the area on the pad of the thumb where the ridges swirl. This is the area you will want to ink. Practice taking prints on any blank white sheet of paper. Lightly touch the inked surface twice and then press downward on the paper. Use more of a tapping motion than a rolling one. When you are satisfied with the look of the practice prints, place five good prints along the bottom of plain white paper or a white card. If you need to scan your print- lay print flat against scanner glass (you may need to apply gentle pressure to scanner lid) scan at 600 dpi and save in JPG format. Please review your prints, if fingerprints look blurry at 100% on screen, you will probably need to adjust your settings. If your file is 1 MB or less, use the File Upload feature. For files larger than 1 MB, place your order, then submit your high resolution digital file in JPG format to service@newmemorialsdirect.com with order number.